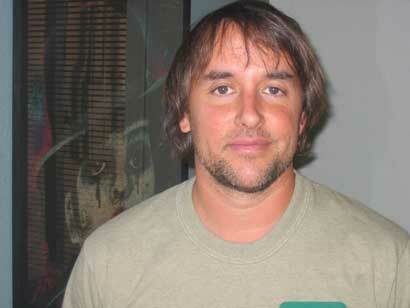 Richard Linklater, the Academy Award® nominated writer/director, will be presented with the 2009 Honorary Maverick Award by the Woodstock Film Festival, during its Gala Award Ceremony, Saturday evening, October 3rd , at BackStage Productions in Kingston, NY. Presenting the Honorary Maverick Award will be Linklater’s long time friend and collaborator, actor Ethan Hawke (Waking Life, Before Sunrise, The Newton Boys, Tape). Linklater’s latest film, Me and Orson Welles will be featured as one of the Spotlight films in this year’s lineup, and he will participate in a panel discussion during the festival, which runs this year from Wednesday Sept. 30 through Sunday Oct. 4th. Through his films he has introduced any number of talented young actors into the Hollywood scene, including Matthew McConaughey, Ben Affleck and Parker Posey. "Richard Linklater's singular approach to filmmaking - always inventing and re-inventing the art in fresh and exciting new ways, coupled with his unwavering support of independent filmmakers- makes him the ideal recipient of our honorary Maverick Award.” said Blaustein. “We're thrilled that he accepted our invitation and can't wait to host him here in Woodstock, where he'll find a thriving film community, reminiscent of the one in Austin, Texas which he so closely nurtured". Richard Linklater said in a statement: "Although the term 'maverick' was greatly devalued in last year's election cycle, I'll humbly take on this honor and as a Texas filmmaker help reclaim the term in the tradition of the famous Texas cattleman Samuel Maverick who refused to brand his cattle. I would like to think it was for humane reasons but the legend goes that he was just too lazy and uninterested in ranching to care. I think there may be an indie filmmaking analogy in there somewhere... regardless, I look forward to being with all of you up in Woodstock this fall." The Honorary Maverick Award is given each year to an individual whose life and work is based on creativity, independent vision, and social activism. Previous recipients include Kevin Smith, Christine Vachon, Barbara Kopple, Tim Robbins, Les Blank, D.A. Pennebaker & Chris Hegedus, Woody Harrelson, Mira Nair and Steve Buscemi. Additional WFF awards include the Trailblazer Award, the Lee Marvin Award for Best Feature, the James Lyons Award for Best Editing, the Maverick Award for Best Documentary, and several others. June 12, 7-11pm at Backstage Studio Productions in Kingston, NY. The Hudson Valley Film Commission will be hosting a HOLLYWOOD ON HUDSON benefit and mixer on June 12 at Backstage Studio Productions, one of only 2 certified soundstages in the Hudson Valley. We expect a great turn out of celebrities, filmmakers, politicians and industry professionals representing all the surrounding counties that benefit from the work of the Hudson Valley Film Commission. The film industry brings in $5+ billion annually to the New York State economy. It is a vital component to economic development in the Hudson Valley. *Your donations will be met by matching funds. Your support will help HVFC continue providing free support to independent & studio features, short films, student projects, TV ads and regional filmmakers. HVFC provides a free online directory, newsletter blurbs, casting and crew calls, job opportunities and much more. Let's all work together to make the Hudson Valley – Hollywood on the Hudson! For information about sponsoring this event, click here. Local film production has been booming since the film credit was re-introduced and we're looking forward to a summer full of productions in all the surrounding counties. Several projects took advantage of the early May flowers (and showers) including Insignia Films RAY/MLK project for American Experience and Winsome Productions' THE BELL, which was partly shot on location at the Woodstock Day School with an eager cast made up of students. Director Erik Weigel rented a house once owned by Preston Sturges during the production. ALIENATED, with a script by Charles Disney and Lee Barron that won 1st place finish at Mafia Short Script Competition. The story, which follows a hit man (Vincent Pastore) and his fear of extraterrestrials, is set for production in June. GONE TO TEXAS, a PBS/ITVS project for which the Hudson Valley will double as Alabama. 24 HOURS AT THE GOLDEN APPLE by director Adam Roe who still seeks extras for night shoots at O's Eatery in Chatham, NY. For up to date information about crew, cast and location needs for upcoming productions, please join us on FACEBOOK. 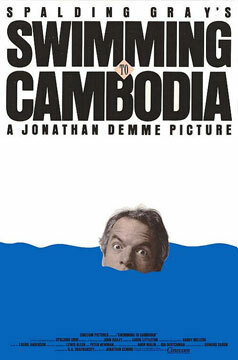 SWIMMING TO CAMBODIA, Jonathan Demme's spellbinding documentary will be co-presented by WFF and Stranger Than Fiction at the IFC Center on Tuesday May 12 in Manhattan. The film will be followed by a reception and Q&A with Academy-Award® winning director Jonathan Demme. In SWIMMING TO CAMBODIA, Demme captures the urgency, terror, humor and brilliance of single performer -- Spalding Gray, who stays seated behind a table at New York's Soho Performing Garage in 1987 for an intense monologue. Gray uses his experiences in Thailand filming the 1984 Academy Award winning film THE KILLING FIELDS as a springboard for all sorts of hilarious, moving digressions, notably a concise and bone-chilling history of Cambodia, and the mass murders brought about by Pol-Pot in the 1970's. There's also Gray's quest for "the perfect moment," a spiritual pursuit that involves drugs, detailed descriptions of the Bangkok brothels, and the apprehension involved in trying to memorize lines for the film. Fellow performance artist Laurie Anderson composed the background music, which along with the ingenious lighting and ambient sound effects perfectly accents Gray's delivery. Demme has crafted a brilliant film of a brilliant performer, infusing the proceedings with a real magnetic urgency, making it hard to look away even for an instant. 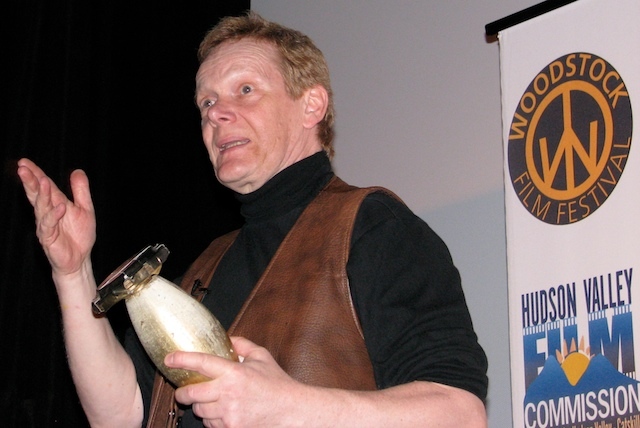 Philippe Petit was greeted with a standing ovation after the recent “hometown” WOODSTOCK FILM FESTIVAL presentation of the Academy® Award winning documentary MAN ON WIREat Tinker Street Cinema on Saturday, October 2. At the beginning of the “aftershow”, Petit removed a gold bowling pin from his duffle bag and balanced it on his chin for the audience (see photo). The bowling pin, he explained, had been retrofitted (with help from two local friends) to weigh the same as an Academy Award statuette. 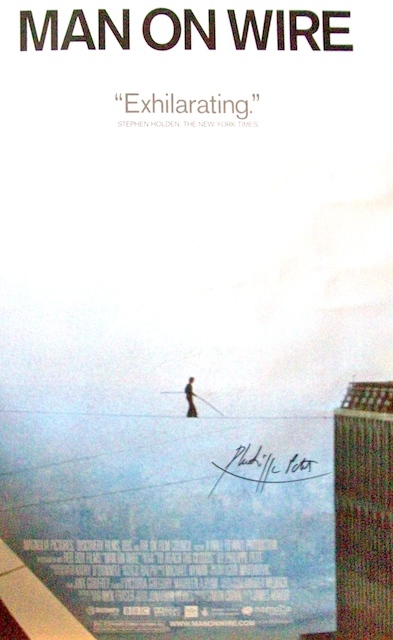 Petit said that he’d practiced balancing a real Oscar® on his chin a few times at Woody Allen's apartment in Manhattan, but the prototype allowed him the opportunity to continue practicing in the event that MAN ON WIRE won an Academy® Award. As we all know, it did win and he successfully balanced the statuette live on television as hundred of millions watched. 120dbFilms along with Ideal Partners hosted the Woodstock Film Festival benefit at Soho House on April 27, featuring Magnolia Pictures summer release THE ANSWER MAN, starring Jeff Daniels and Lauren Graham . The event was a resounding success, with appearances by cast members Lauren Graham (Flash of Genius, Evan Almighty, The Gilmore Girls, Guys and Dolls) and Olivia Thirlby (Juno). 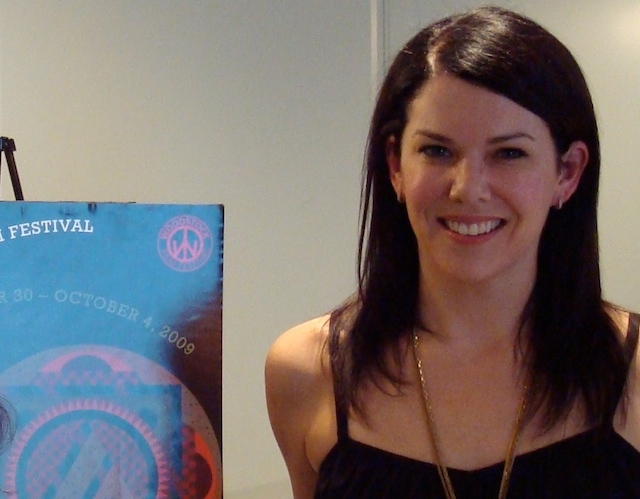 Everyone in attendance enjoyed the screening, and then got the opportunity to hear Lauren Graham share stories about the production process, as she stopped in on her day off from her Broadway production GUYS AND DOLLS. One highlight from the evening was Lauren's exchange with an aspiring young 12 year old actress who was thrilled to meet one of her idols up close and personal. Lauren's advise to the audience "be nice to your waiters", following her story of how film director John Hindman first met her (he was her waiter), was well appreciated by the audience as well. Following the screening, everyone enjoyed meeting Academy Award® nominee Melissa Leo, who joined us for the reception. Liquor sponsor CÎROC Vodka was flowing and delectable hors d'oeuvres were aplenty as everyone mingled and networked and had a good time. A few fabulous auction items added to the festivities including house seats for GUYS AND DOLLS and dinner for two at the Cookshop. Thanks to Soho House, 120dbFilms, Ideal Partners, Magnolia Pictures and CÎROC Vodka for making this a memorable night. PRESSURE COOKER, a compelling, award winning feature documentary directed by Jennifer Grausman and Mark Becker, opens May 27 at the IFC Center in Manhattan. See their website for the complete release schedule. The film follows three seniors at Philadelphia’s Frankford High who find an unlikely champion in their Culinary Arts teacher, Wilma Stephenson. A legend in the school system, Mrs. Stephenson’s hilariously blunt boot-camp method is validated by years of scholarship success that’s taken countless students from the city’s working-class neighborhoods to the top culinary schools in the country. Under her fierce direction, the usual distractions of high school are swept aside as Erica, Dudley and Fatoumata prepare to achieve beyond what anyone else expects from them. Click here to view the Trailer. JULIA (WFF2008) Directed by the talented Erick Zonca (The Dreamlife of Angels) was released in theaters nationwide by Magnolia Pictures on 5/08/09. Tilda Swinton plays JULIA–a 40 year old alcoholic. She is a manipulative, unreliable, compulsive liar, all strung out beneath her still flamboyant exterior. Between shots of vodka and one-night stands, Julia gets by on nickel-and-dime jobs. Increasingly lonely, the only consideration she receives comes from her friend Mitch, who tries to help her. But she shrugs him off, as her alcohol-induced confusion daily reinforces her sense that life has dealt her a losing hand and that she is not to blame for the mess she has made of it. Glimpsing imminent perdition, and after a chance encounter with Elena, a Mexican woman, Julia convinces herself - as much in panic and despair as for financial gain - to commit a violent act. As the story unfolds, Julia's journey becomes a headlong flight on a collision course, but somehow she makes the choice of life over death. Kief Davidson's insightful and beautifully shot documentary KASSIM THE DREAM opensJune 5 at the IFC Center in Manhattan. Ugandan born American boxer Kassim "The Dream" Ouma has lived a harsh and unbelievable life. At six, Kassim was abducted and turned into a child soldier, forced to experience and perpetrate violent atrocities. Finally fleeing Uganda and training as a boxer in the U.S., he has become the Junior Middleweight Champion of the World. In Davidson's film, Kassim simultaneously prepares to return to Uganda, in the face of a possible death penalty for desertion, to reunite with his family and to win his hardest fight yet, a bout with the Middleweight Champion of the World. Kassim, despite his cruel childhood, is amazingly kind and jovial with his family, friends, competitors, fans and the frightening figures of his childhood. Kassim The Dream explores the drama of facing a horrifying past and rediscovering a long, lost home. We’d like to extend our congratulations to WFF friends and filmmakers who received recent acclaim at the 2009 Tribeca Film Festival. Paola Mendoza and Gloria LaMorte's beautiful film Entre Nos is based on Mendoza's real-life experiences as a child, when her family moved from Colombia to New York City. Their sensitive depiction of issues ranging from immigration to poverty to single motherhood earned them an Honorable Mention at this year's Tribeca Film Festival. In 2006, Mendoza's documentary Autumn's Eyes was a finalist in the Woodstock Film Festival documentary competition. It won Best Editing Award for Feature Documentary. Best New Documentary Filmmaker Award at the Tribeca Film Festival went to Ian Olds forFixer: The Taking of Ajmal Naqshbandi. This emotionally mesmerizing documentary takes an intensely personal journey into the dangerous and unseen world of wartime news gathering, where nationality can determine the value of a life. A Westerner's abduction will make headlines around the world, but director Ian Olds' examines what happens for those who don't make the international headlines. 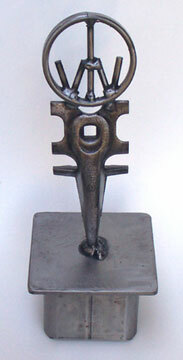 Olds' short film Two Men won Best Short at the 2005 Woodstock Film Festival. His following short, Bomb was shot and cast in the Hudson Valley. For those of you who missed the Tribeca screenings, Fixer: The Taking of Ajmal Naqshbandiwill be premiering on HBO on August 17. Congratulations and good wishes to both filmmakers for their successes! Hot Docs recently honored the cutting-edge works of documentary filmmaker and longtime WFF friend Ron Mann for their 2009 Focus On retrospective, an annual program showcasing the work of a mid-career Canadian filmmaker. The Focus On retrospective featured seven different works by Mann. “Ron Mann is a truly maverick filmmaker, with a feisty, bold body of work that has carved its own niche exploring curious counter-cultures,” commented Sean Farnel, Hot Docs’ director of programming. For over 25 years, Mann has been creating award-winning documentary features that focus on alternative and dissident cultures, beginning with a look at the once-controversial free jazz movement of the 1960s in IMAGINE THE SOUND (1981). He has examined the “Dial-A-Poem” poets with POETRY IN MOTION (1982), the history of comics with COMIC BOOK CONFIDENTIAL (1988), the politics of marijuana with GRASS (1999), environmental causes GO FURTHER (2003), the world of Ed "Big Daddy" Roth in TALES OF RAT FINK (2006) and most recently the wonderful world of fungi with KNOW YOUR MUSHROOMS (2008). The tracks for Simone Felice's new project with Robert 'Chicken' Burke – THE DUKE & THE KING were recorded at The Chapel in the woods of Bearsville. 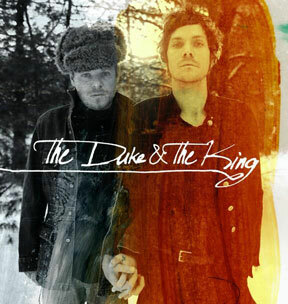 A hand-numbered, limited edition four song double 7" EP will be released in the UK in May as an introduction to THE DUKE & THE KING a week before their one-stop live London debut (Bush Hall, May 26, get tickets now!). They will also be at The COlony in WOodstock on May 22. NOTHING GOLD CAN STAY, their first full length album will be released in the UK on July 13 (Vinyl/CD/Download). In August, the album will be released in the US on North Carolina indie, Ramseur Records. Simone Felice (The Felice Brothers / author of "Hail Mary Full Of Holes" Uncut Book Of The Month March '09) and Robert 'Chicken' Burke (George Clinton/Drugs, Sweet Honey and the Rock/Toshi Reagon) mixed the music in Brooklyn with Grammy award winning hip hop maestro Bassy Bob Brockmann (Notorious B.I.G's Ready To Die). Check out some of the tunes on myspace. 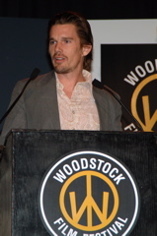 The WOODSTOCK FILM FESTIVAL (Sept 30th – October 4th, 2009) is currently accepting submissions in all categories. Maverick Awards are presented for Best Feature ($5000 cash), Best Documentary, Best Short Documentary, Best Short Film, Best Student Film, Best Cinematography, Best Editing and Best Animation. Cash, prizes and/or services are given out in each category. Audience Awards are presented for Best Feature and Best Documentary. Award sponsors have included The Lee Marvin Estate, the late James Lyons, Lowel-Light, Apple Computers, Final Draft, Post Factory, A&E Indie Films, Docurama, Kodak, Baseline, Markertek, and others. Industry participants have included Ang Lee, Kevin Smith, Steve Buscemi, Peter Saraf (Big Beach Films), Jonathan Sehring (IFC), Ted Sarandos (Netflix), Bob Berney, Eamonn Bowles (Magnolia Pictures), Mark Urman (Senator), Bingham Ray (Kimmel Entertainment), James Schamus (Focus Features), Fisher Stevens (Greenstreet Productions), John Sloss (Cinetic Media), Ira Deutchman (Emerging Pictures), Ron Mann (Films We Like), John Pierson (Grainy Pictures), John Anderson, Ryan Werner (IFC), Tom Quinn (Magnolia Pictures), Christine Vachon (Killer Films), Andrew Hurwitz, Ira Schreck, Mira Nair, Todd Haynes, Woody Harrelson, Tim Robbins, Marcia Gay Harden, Lili Taylor, D.A. Pennebaker, Albert Maysles, Barbara Kopple, Leon Gast, Liz Garbus, Brett Morgen, Thelma Adams, Robert Downey, Zachary Sklar, Kevin Bacon, Ethan Hawke, Matt Dillon, Rosie Perez and many others. Click here for details and online entry form. The 10th Anniversary of the Woodstock Film Festival is grateful to be the recipient of a 2009 grant from the Academy of Motion Picture Arts and Sciences. The underlying purpose of Academy Foundation Grants in assisting festivals such as WFF is to engage diverse audiences and to encourage filmmakers, particularly those for whom a festival showing is a much needed opportinity for exposure to and feedback from those diverse audiences. The Academy Foundation Grant will also support Woodstock Film Festival's annual PANEL PROGRAM, which seeks to increase interest and understanding of cinema among the public at large and those interested in a career in film–from acting, writing and the creative process, to financing, distribution and marketing. The Panels cover a broad spectrum of artistic, technical and social issues, bringing a large and diverse group of esteemed members of the film world together with the local communities. Topics have included New Trends in Independent Filmmaking, Where Journalism Ends and Filmmaking Begins, Music in Film,Origins of Film Story, Artistic Expression in a Time of Censorship, New Trends in Distribution,Actors Dialogue, Amazing Women in Film, Conversations with…, and Case Studies. Panelists have included emerging and established industry members including Steve Buscemi, Tim Robbins, Parker Posey, Marcia Gay Harden, Kevin Bacon, Haskell Wexler, Ellen Kuras, James Schamus, Ismail Merchant, Elmer Bernstein, Bob Berney, Eammon Bowles, Mira Nair, Ted Sarandos, John Sloss, and many more. and sustainable economic development through film, video, and media production and exhibition. The Hudson Valley Film Commission promotes sustainable economic development by attracting and supporting film, video, and media production to the Hudson Valley Catskills. Join us for special events through the year including HVPG screenings. The Hudson Valley Programmers Group is dedicated to creating, curating and administering a touring road show program that brings internationally renowned filmmakers and artists to the region, and providing them with the opportunity to exhibit their work and interact with the community. Darko, hesitant at first soon gave in to my constant petitions to visit him. The day I brought them both to JFK to return to Serbia permanently, Bojana whispered something in Darko’s ear as we hugged saying our goodbyes all three of trying to hold back tears of parting and Darko looking me in the eye said something to the effect, “Jill, don’t worry as soon as you can afford it call me and we’ll arrange your visit.” Darko never could stand to see me cry which on many occasion I did owing to the loss of my two children and other personal challenges in my life. They turned and boarded their plane to Belgrade as I drove back to New Jersey. Driving home I felt an odd combination of extreme sadness at the loss of my two best friends mixed with the cheerful prospect I would shortly be boarding a plane myself destined for Serbia and Montenegro by mid August 2002 when my student loan check arrived. Upon arriving home I immediately began making all necessary arrangements for my forthcoming trip. There were only two days left of my vacation at this point; I didn’t feel like doing much of anything. I’d come down with terrible stomach symptoms that began in Budva several days prior. This was probably owing to my ignoring Darko and Bojana’s warning not to drink tap water but only bottled; a lesson I ought have learned in Indonesia as a young girl. We were all feeling tired and slightly under the weather merely wanting to recuperate. Notwithstanding, Darko, always an avid early morning riser, insisted we promenade Beograd’s renown indoor marketplace; an extremely large indoor flea market. We walked approximately an hour or two. I tried on several dresses before finally buying myself one; the type I can’t recall. Bojana bought herself Serbian brand makeup after which Darko informed us it’s time to leave. Shopping was always boring to Darko unless it was for himself and during his stay in the United States Darko, Bojana and I hit many malls in New York and New Jersey such as Willow brook in Wayne, New Jersey. Other favorite stores we often visited were Daffy’s and Macy’s in Forest Hills, Queens, New York. I vividly remember the Republika Srpska diplomatic contact to the Hague court in the Netherlands visiting. Me, Darko, he whose name was Dan in English, along with my daughter little Jill went to Macy’s at the Willow brook Mall in Wayne NJ allowing Dan to buy some gifts for his girlfriend back in Bosnia. Afterwards, we all enjoyed a wonderful lunch at Six Brothers Diner on Route 46 not to far from Montclair State University in New Jersey. I can’t recall whether it was prior to vacationing in Budva or after, but close to the Beograd marketplace we visited the apartment of a Serbian basketball player and his disc jockey roommate (the walls of the apartment were covered with music CD’s from around the world). It was a very impressive CD collection. He said he often spent time in Manhattan studying when not having to compete. I became increasingly sad during this time owing that in another day I’d again be saying goodbye to the man I loved, Darko; perhaps leaving Serbia forever. I wanted to stay and live in Beograd permanently but I had duties to my graduate studies at FDU in Hackensack, New Jersey. Had I known the university (FDU) would be soon dismissing me from their graduate program similarly to the New School for Social Research, I would have stayed in Beograd. I always told Darko my greatest desire was to live in Serbia and/or Montenegro. He always replied, “Jill you have your children and your studies now. After your children leave and you complete your graduate degree, then you can come reside in my country.” After the New School discriminated against me and I was recently receiving poor grades at FDU from professors that had formerly studied and graduated from the New School themselves, I felt I wanted to leave America thinking strongly I would have more academic freedom in Serbia. In fact during my entire Serbian trip, I discovered that myself and others freely spoke our minds on a myriad of subjects such as politics and theology without being badgered. This was my personal experience and I know allegedly not all Serb citizenry under previous regimes enjoyed such privilege. Upon leaving the marketplace we enjoyed lunch at Darko’s which Bojana prepared; she was an excellent cook! My favorite Serbian food is Gibanica (I think this is the correct spelling). Gibanica is an exquisite main dish comprised of Greek filo dough, beef, cheese and sometimes spinach baked in layers similarly to Italian lasagna. After lunch, I decided to walk by myself to a local store for purchasing some items. I wanted some air alone outside not wanting Darko to see me cry. As aforementioned, I became extremely sad about returning to the United States the following day. When returning to the apartment, Darko suggested I nap a while so I did. I don’t remember what time it was when Darko knocked on my door waking me up. He informed me we were heading out soon to meet up with a friend of his named, Sharko, he wanted to introduce me. We left Darko’s apartment after dusk and about ten minutes later parked nearby a beautiful green park lined with trees along the river, somewhere in Beograd. Uncertain exactly where we were going, I allowed Darko and Bojana to lead. Strolling down the narrow paved path a few feet wide cutting into a grassy hill, we headed directly towards a boat restaurant. Traversing the small shaky wooden bridge, we boarded. The place was empty; we were the only persons present besides one waitress. We sat as follows; Darko and Bojana sat next to each other as in American restaurant booth’s and I sat alone across vis-à-vis. The boat itself was very luxurious resembling the interior of several large boats formerly owned by the late Aristotle Onassis. I have several books on Aristotle Onassis so I have seen photos of the interior of his large boats. The waitress came over to take our order; there was no menu. We verbally told her which libation we wanted; as she walked away Sharko came in. Sharko was Ratko Mladic; he wore old faded blue jeans sagging a bit around his waist. I wasn’t scared at all. When first shaking hands with Mr. Mladic I thought quietly, this couldn’t possibly be happening; but it in objective reality it was really happening. I’ve met many interesting people since graduating WPUNJ in New Jersey in 1997. I personally coined the term, extreme sociologist which I consider myself. I may not be rich, but achieved my scholarly goals notwithstanding either FDU or the New School for Social Research in Manhattan dismissing me from their graduate study programs. Since completing my undergraduate degree, I’ve desired to better understand our world by meeting with and talking with the world’s most controversial individuals. I believe in traveling to hidden and seemingly remote places around the world, partaking in local cultural activities for better understanding wherefore people behave as they do. Mladic first seated himself across from me, in a separate chair the right of Darko. The waitress returned asking Mladic what he preferred to drink; he ordered expensive wine saying jokingly it was “two hundred dollars a bottle,” smiling. I was already drinking an alcoholic beverage of some sort I can’t remember along with Bojana. Darko rarely drank and sipped on something non-alcoholic. Extolling me to Mladic, Darko explicated whereby I was the only American college student standing firm on grave issues pertaining to international justice insofar, the NATO and the former Yugoslavia. Darko finished boasting about me to Mladic after which I in an extremely forceful forthright manner explained to Mladic my political views insofar as NATO’s breaching international law by launching military aggression against the former Yugoslavia, by bombing the Chinese embassy in Beograd, and, by purposely bombing other civilian targets in Serbia and Montenegro in 1999. I have a film of when NATO bombed a newborn baby hospital unit in Beograd; disgraceful! Mladic seemed impressed with my viewpoints on war and peace. He was very warm friendly man; very relaxed and laid back. He smiled the entirety we were chilling out just enjoying each other’s company and drink. Hanging out with Mladic was no different than chilling with my other friends back in America. I ordered another drink with Darko’s disapproval. As aforementioned, Darko strongly disdained mind altering substances, always trying to help me overcome my craving for them. Then, Mladic opened his wallet, showing me photos of his wife and children; he had a very attractive family as portrayed in his wallet sized photos. I think he missed them, perhaps empathizing to the loss I felt being estranged with my own two children for so many agonizing years. Like General Mladic, I possess very few photos of my own children. The photos Mladic had in his wallet were obviously very old because his children were still very young in the pictures. It was evident he didn’t have any recent photos of his family in many years; I sympathized with him in this respect. After reminiscing over family photos he got up sitting next to me across from Darko and Bojana. I let him hold my hand gently massaging it. He kissed my hand, inviting me to spend the night with him in the hills of Beograd; I declined on account of my strong Orthodox Christian theological convictions. I admit Mladic having warm inviting hands and greatly enjoying the manner in which he touched me. I did consider him an attractive man; yet as aforementioned I declined his invitation. He accepted my decision although he did ask me again; again I replied the same answer. It was getting late and I was departing Serbia the following day in the afternoon. Still sipping my drink, I began urging Darko to return to America with me making a life for himself teaching as a professor at a university. In retrospect, I now feel tremendous guilt and shame because of my advances towards Darko owing to Bojana my best friend sitting there with me vis-à-vis. Feeling a bit tipsy from drinking, Mladic continued making sexual advances towards urging me to go home with him. Darko laughed seemingly thinking Mladic’s advances towards me were cute stating, “go ahead Jill, spend the night with Sharko, it’s fine…Sharko‘s a good friend of mine…don‘t worry if you want to…I promise you’ll not miss your flight back to America tomorrow…“ I continued declining the advances and when it became obvious I wouldn’t change my mind, Darko said we had to leave because I had to finish packing for my flight and get a good nights sleep. We all departed identically to boarding the boat restaurant, crossing the small narrow wooden bridge; Sharko/ Mladic departed with us. After exiting, Mladic and I stood in front of the boat restaurant for several minutes. I began crying because I loved Serbia not wanting to leave the next day. Mladic pulled me close to him and embracing me, he kissed both my cheeks. I kissed his cheeks also embracing him. Darko and Bojana were walking ahead towards the car leaving me and Mladic alone. Knowing, I’d continue crying, I broke our embrace saying “goodbye.” Mladic promised to visit me the next day dressed in his full military uniform before I left Serbia. I didn’t want to part; but I did. I saw Darko and Bojana walking towards their car up the grassy hill and followed. I walked briskly catching up with them; I was exhausted and still had to finish packing back at Darko‘s apartment. Once more I turned and saw Mladic drive away in an old brown Mercedes Benz on its left front side. I was surprised to see it was scratched and slightly dented. Arriving back at Darko’s place, I completed preparations for departing the following day and fell fast asleep. The next day I woke up around mid morning feeling depressed so I went for a walk to a local store picking up some things. Returning to Darko’s, we were standing outside his apartment discussing something when I turned seeing Mladic approaching me in full military regalia. We shook hands glad seeing each other. Of all photos I’ve seen online, Mladic never looked better than he did then. His military uniform was clean, ironed and he wore every military metal ever earned it seemed to me. He was as honorably decorated as any of the American Joint Chief’s of Staff; even wearing his gold colored in sigma upon his green military cap. He had many gold colored metals hanging from his uniform on the left side by his chest. I was privileged to see him this way; I confess being impressed. I was surprised to say the very least. Darko said to stand next to Mladic insisting on snapping some photos of the two of us. Mladic placed his arm around my shoulder and I his; we both smiled as Darko snapped some photos. When finished Mladic presented me with a gift. The book I posted online for you all to view, signing it to me under the alias name, Sharko thanking me for beautiful times spent together in Beograd. We embraced and he left as Darko interjected saying we had to hurry to the airport before I miss my flight. Darko’s German friend delivered me back to Beograd airport the same manner as picked up. There was little time, my flight was actually locking the gate and about to depart without me. Darko ran up to someone important showing his governmental badge as I recall, asking them to hold the flight until I board. There was hardly time for JAT to weigh my luggage; they did however inform me it weighed over the limit allowed. Darko said there was no time to be picky about what I was bringing back to the States ; I obeyed leaving one full suitcase behind with him as to not miss my flight. Quickly helped me through customs and the gate, I tried prolonging our goodbye. Darko didn’t want seeing him cry and urged me on as the Serbian flight attendant waved me to hurry. The gate was closed up and I had to run with my carry on to board the plane. One last time I turned briefly to see Darko; he tried hiding the tears swelling in his eyes as I. I took my seat on the JAT flight back home to America. Upon reaching JFK my luggage was lost and it was delivered over the weekend to my home in Bloomingdale New Jersey. This is what it’s like to chill with the most ruthless men in the world. No biggie really. in New York City on establishing a permanent International Criminal Court. over the entire world, that you should fully comprehend its meaning and raison d’etat. internationally applying equitable social justice and peace for our perpetual human survival and for our posterity [without prejudice], should read these documents. PS: I probably have other documents I’ll have to check. Start reading these including a scanned photo image of the secret Richard Holbrook and Radovan Karadzic Immunity Agreement.